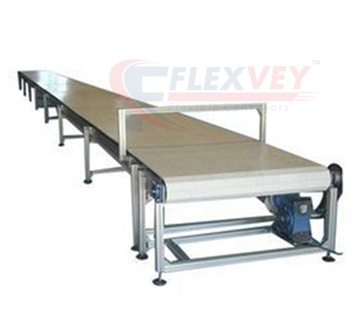 We Flexvey are the foremost initiator and supplier of flexible types of FMCG Conveyor in India. We are engaged in preparing of amazing quality of these conveyors from the parts to its functioning processes. These FMCG Conveyors are cheaply available within our premise and as well many customers get benefitted with this product from our company. Currently, this conveyor stands leading among the market and we are one of the famous among them to provide these conveyors with strong capability to hold the mass materials without any trouble and it is also very fine in quality in providing the regular service and non-destructible in nature.